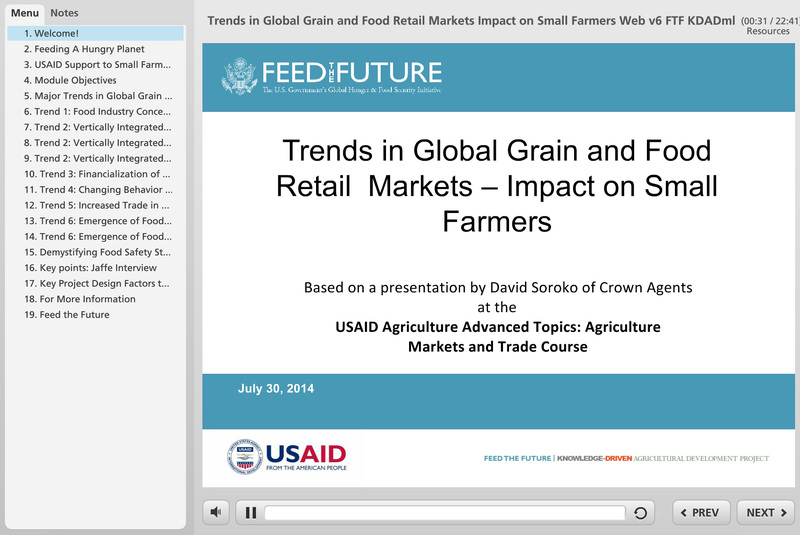 This online training provides a brief overview of developments in global food grain and food retail markets, and how these developments affect small farmer opportunities to sell to export markets and growing urban and middle-income domestic markets. Changes affecting small farmers, discussed in this 22 minute module, include food industry concentration, vertically integrated supply chains, increased trade in value-added products, and the emergence of food standards. The module concludes with considerations for development professionals as they go about designing programs to help small farmers compete in globalized markets. Although the presentation is not a deep analysis of data and evidence supporting these changes, the module offers broad insights into the behavior of agriculture markets and market participants – traders, sellers, and buyers – as they adjust to trends in consumer demand. This module is intended for USAID agriculture development professionals and other USAID staff involved in the design and management of agriculture and food security programs, as well as external partners working on smallholder market access. Content is at the intermediate level, thus viewers already familiar with agriculture markets and how they function will gain the most from it. Audiences who need an introduction to agriculture markets should first view the Agriculture Markets Overview Prezi, also available on this Agrilinks page. Increase awareness of major food and food-grain market trends impacting the ability of small farmers to sell to export markets, as well as to middle-income consumers. Gain insights in designing programs that help small farmers compete in globalized markets.